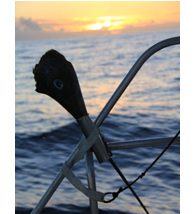 Rabitech caters for all your spearfishing and freediving needs. Rabitech caters for all your spearfishing and freediving needs. We are the proud manufacturer of the Rabitech range of spearguns that we export to a number of distributors abroad. Our shop also stock many other brands of spearguns as well. We also stock all the other gear like wetsuits, fins,masks and snorkels as well. We are the OMER, Sporasub and Shark Shield agents for South Africa and distribute gear to shops all over South Africa. We do also stock gear from Cressi, Mares, SeacSub, Rob Allen, Aeris, and many others. Rabitech is a small business where service comes first. Our workshop also do alterations and repairs on spearguns. I saw the need for a specialized spearfishing shop in 1998 when we started. I came out of the South African arms industry where I worked for ten years as a project officer on many specialized ammunition systems. This experience with my love of spearfishing is extremely valuable for me in running a business of this nature. We offer a Variety of Specials.